While we have plenty to say about last night’s Super Tuesday primaries, we’re beginning this morning with the still-unfolding Veterans Affairs story, because there’s a chance it could dominate today’s news. The White House has just announced that President Obama will meet at 10:00 am ET with embattled Veterans Affairs Secretary Eric Shinseki, as well as Deputy White House Chief of Staff Rob Nabors (who was dispatched to help fix the VA’s problems). And Obama will make a statement to the media immediately after that meeting. 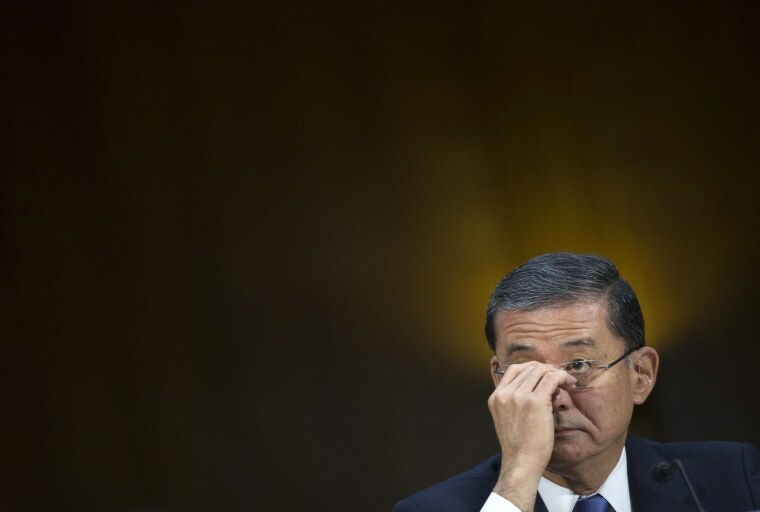 Is Shinseki headed out the door? We don’t know the answer, and it’s unlikely Shinseki would exit today -- it just isn’t Obama’s style. But what we do know is that the president, potentially, has a feeding frenzy on his hands; there is always going to be someone willing to complain about the state of the VA, even if all of its bureaucratic problems date back for decades. And it’s now turned into a local news story, in which news organizations are looking closely at their own VA hospitals. Perhaps more importantly, the story has resurrected all of the complaints about President Obama’s management style, especially during a crisis. He’s too methodical. He doesn’t get that mad. He seems to have found about this at the same time everyone else did (through the news). And he’s always a couple of beats too slow in taking action. All of those things are being re-litigated in this VA story. But how do you show leadership when you don’t know all the facts (yet) and when your options are limited? On the other hand, Obama’s defenders counter with these questions: How do you show leadership when you still don’t know all the facts of the story? (People are still investigating if there was a bureaucratic cover-up about waiting lists of VA patients not getting care.) How do you show leadership when your options are limited? Do you demand that Congress spend hundreds of billions of dollars to improve the VA hospitals? Do you ask Congress to pass legislation privatizing the VA or folding it into either Obamacare or Medicare? Both seem like unrealistic options. After primary contests in six states last night and after a late night watching returns, here’s our take on Super Tuesday’s winners and losers. The biggest winner was the Republican Party and its chances of retaking the Senate next year. The reason why: Its voters didn’t advance a seriously flawed Tea Party candidate (think Christine O’Donnell, Sharron Angle, or Todd Akin), which would give Democrats a better chance of winning in Georgia or Kentucky. Instead, the candidates the party has viewed as the most formidable on paper -- Mitch McConnell over Matt Bevin, a runoff of David Perdue and Jack Kingston instead of Paul Broun or Phil Gingrey -- were the ones who won or advanced. And throw in Monica Wehby, who won the GOP Senate nomination in Oregon and who gives Republicans an outside shot in that Democratic-leaning state. Back in 2010, former Sen. Jim DeMint (R-SC) said, “I’d rather have 30 Marco Rubios in the Senate than 60 Arlen Specters.” And that attitude produced a line of unelectable GOP nominees from 2010 to 2012. But last night and also in North Carolina earlier this month, Republican primary voters have lined up behind the candidates the party believes are the strongest for the general election. Another winner from last night were the outsiders. Think Tom Wolf, who won the Democratic nomination in Pennsylvania’s gubernatorial contest. Also consider David Perdue in Georgia, who said this after advancing to Georgia’s Senate runoff in July, per MSNBC’s Benjy Sarlin: "One thing we did do tonight is we retired three career politicians -- and we got one more to go." And Wehby’s victory in Oregon was another victory by a political outsider. The other winners last night will be political watchers, who will have almost six months to follow what should be a great general-election contest between Mitch McConnell (R) and Alison Grimes (D) in Kentucky. Ditto Arkansas’ Senate contest between Mark Pryor (D) and Tom Cotton (R), which was finalized in last night’s primary in the Razorback State. The biggest loser was the Tea Party, which lost in Kentucky (Bevin), in Idaho (with incumbent Rep. Mike Simpson winning over challenger Bryan Smith), and in Georgia (with both Paul Broun and Phil Gingrey finishing at the bottom of the Senate primary). For the Tea Party and the Club for Growth, a lot is riding on next month’s primary in Mississippi (more on that race below). If the Republican Party was a big winner from last night, then it’s natural to assume that the Democratic Party was a loser, because it didn’t luck out with an unelectable candidate in either Georgia or Kentucky. That said, both general-election races will be close. And watch the Perdue-Kingston runoff over the next two months, which is going to force both Republicans to spend A LOT of money and run HARD to the right. Democratic nominee Michelle Nunn won’t have to run a single TV ad hitting either Perdue or Kingston; the two Republican candidates will do that for her. Another loser last night were the female Democratic candidates in Pennsylvania – Allyson Schwartz for governor and Marjorie Margoiles for Congress. As the New York Times’ Jonathan Martin points out, it’s looking likely that that Pennsylvania next year won’t have a single female member of Congress, senator, or governor. Wow. Speaking of victory speeches, Wehby in hers addressed the multiple “stalking” and “harassment” allegations surrounding her. “Look, Lord knows I'm not perfect. I am like countless other Oregonians. I'm a working mom who balances a career that I love with children that I adore and would do anything to protect. I try my best, but in my life I’ve made some mistakes,” she said. “My message to the Democrats who are willing to shred my family for their own political gain is that people are tired of your dirty tricks. The best way to defeat a bully is to stand up to them, and that is exactly what we are going to do. Tonight, we are sending a message that this Senate race will not be decided by the ugly kind of politics that people in Oregon and across the country are sick of. That time is over." Lastly, don’t miss the TOUGH radio interview that Mississippi candidate Chris McDaniel had regarding the blogger who was arrested for filming Sen. Thad Cochran’s bedridden wife. It’s quite possible McDaniel and his campaign had nothing to do with the blogger, but McDaniel’s statements and body language are striking. He walked into a buzzsaw in that interview.